Born on January 4, 1985 in Monticello, Mississippi, Al spent his childhood in the small nearby town of Prentiss, complete with a population of just 1,500. The Jefferson family was a staple of the Progress community, a close-knit, predominantly black section of Prentiss. While his mother Laura worked as an assistant teacher in Prentiss Elementary School, Al’s father was killed in a work-related accident when he was very young, leaving him without the guidance and discipline a father figure provides. He had a strong support system around him – his grandmother, Gladys Jefferson, lived on the same property as Al and his mother, and several other family members lived in the nearby town of Progress. But not having a father in his life allowed Al to find his way into trouble as a boy. Al entered his teen years, though, and an incredible growth spurt saw him sprout into a 6’4” eighth-grader, and saw him discover what would become his first love; basketball. Al started as a freshman for Prentiss’s varsity squad, and it was evident he possessed superior athletic ability in addition to his now 6’8” frame. But it was in his junior season where he became one of the elite players in the country, drawing the attention of both college coaches around the country, and the scouts of the NBA. The Prentiss High School basketball team had been known as a Jekyll and Hyde-type squad, with Al its premier player. When the playoffs began for the 2002-2003 season, Al took his team on his shoulders and willed them all the way to Mississippi 3A State Championship Final. He averaged 44 points over the Bulldogs’ three-game run and was the driving force behind capturing the 3A crown. That he viewed the championship as a team accomplishment in spite of his tremendous performances came as no surprise to those closest to him. Known as one of the most polite young men you could ever find, the budding star now known as “Big Al” never let his increasing popularity go to his head. While he possessed freakish athletic ability and an NBA-ready body, his humility and loyalty showed what kind of person teams at the next levels were hoping to get their hands on. 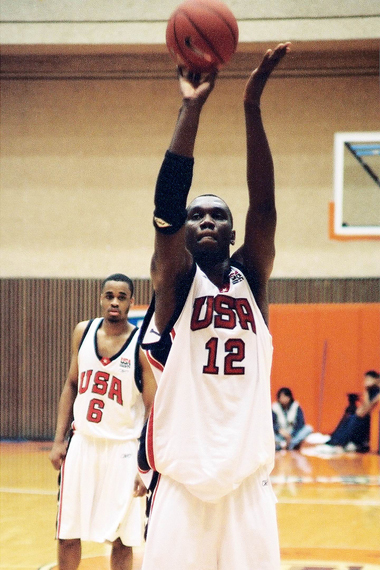 After his dream junior season, Al was given the opportunity to play for the US Junior National Team, an honor bestowed on only the nation’s top high school players. But the now 6’10” phenom had already committed to play for a local AAU team, the Jackson Tigers, so he turned down the offer thousands of kids across the country dream of. Heath was hoping to bag the man-child from Prentiss for his rebuilding program, and Al had narrowed down his top three college choices to LSU, Mississippi State and Arkansas after his junior year ended. He scheduled visits with all three schools, with Arkansas the first on the docket. His mind made up to join the Razorbacks after graduation, Al received an invitation at the end of the summer to attend the great Michael Jordan’s basketball camp in California. At the end of the camp, Jordan divided the campers up into two squads for a pickup game, and Al had the good fortune on being on No. 23’s side. The high schooler with a moment he’d never forget. The result was a ferocious alley-oop dunk, off a feed from His Airness. “Twenty years from now, I can tell my kids about it,” Al said at the time. But the experience raised more questions than excitement. Did it prove he was ready to play with the big boys in the NBA? Was college the right decision? Pro scouts from virtually every NBA organization made the pilgrimage to Prentiss to see Big Al torch opponents as a high school senior. He didn’t disappoint, dominating his competition and earning a spot in the McDonald’s All-American game, as well as All-American nods from Parade and USA Today. He was also named a finalist for the Naismith Award, granted to the nation’s top prep school player, and was named Mr. Basketball in the state of Mississippi. Averaging 44 points over the course of his decorated high school career proved Al was ready to take on the college game. But after consulting with his friends and family, he decided to forego his scholarship to Arkansas, and pursue his dreams by entering the NBA Draft. Big Al was going pro. 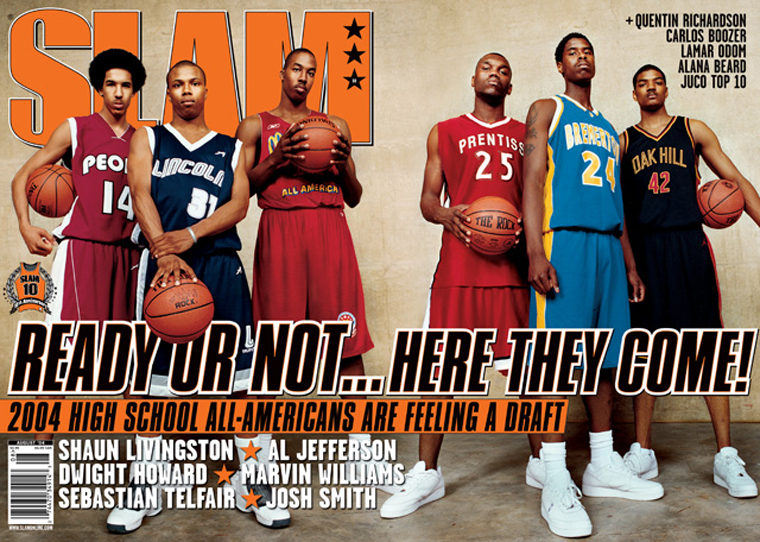 The Jefferson clan turned out to the Big Apple in full force for draft day in June of 2004, and with good reason. Al had received a commitment from the Miami Heat they would select him if he fell as far as the 19th pick, so he had the comfort of knowing he’d be a first-round selection. But as the first round wore on, nervousness began to creep in. After over an hour of waiting, Chris Wallace, the Celtics’ general manager, phoned Al’s agent to tell him Boston would select him with the next pick. 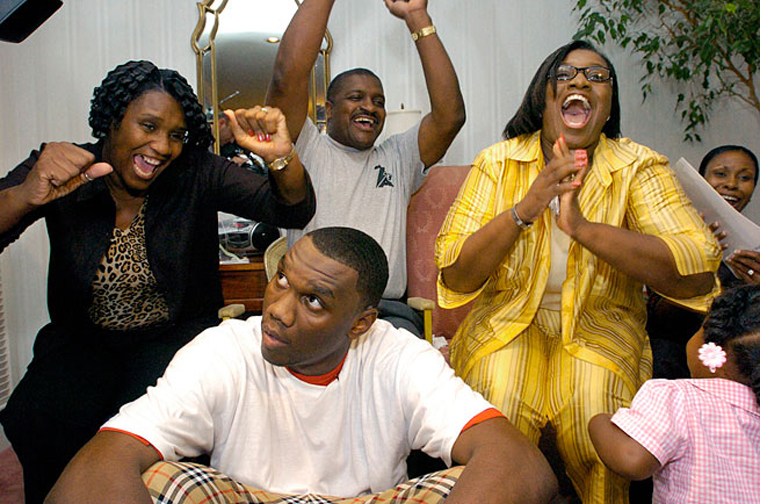 When commissioner David Stern called his name as the 15th pick, the Jefferson family rejoiced. Al would be playing alongside players he’d grown up idolizing; Paul Pierce, Gary Payton, and Ricky Davis among others. His dream had come true, and he was officially an NBA ballplayer. Now, it was time to get down to business. Being the first high school player ever be drafted by the storied Boston Celtics carries a boatload of expectations, but Al proved from the moment he arrived in training camp he was up to the task. He studied the veterans’ every move, and put his ferocious work ethic on display day in and day out. The results on the court were respectable for a 19-year-old rookie, with Al posting solid number in points (6.7) and rebounds (4.4) in just over 14 minutes a night. The Celtics earned a spot in the Eastern Conference playoffs, and in game six Al was thrust into a crunch-time situation. The game against the Indiana Pacers had gone to overtime, and the team’s star player, Paul Pierce, had been ejected. Al knew his teammates needed him to step up, so he skied for the opening tip and won it to start the overtime, and seconds later scored on a lay-up to give the Celtics a lead they’d hold on to for good. While the Celtics didn’t advance in the playoffs, Al had announced to rest of the league that a future star was developing in Boston. With the promise of a productive rookie season came heightened expectations from Celtics Nation for Al’s sophomore campaign. It left something to be desired, however, as he was limited to just 59 games after suffering a bone bruise in his ankle in a game against the Los Angeles Clippers. He attempted a comeback in the second-half of the ’05-’06 season, but was put back on the shelf after just 12 games. The pain was too much to bear, but fans perceived Al’s inability to explode and fight in the paint as a lack of toughness. “People didn’t really understand how much it hurt,” Al said of his ankle. Over the summer, Al used all the criticism being thrown his way as motivation, and came back to training camp in the best shape of his life. He had hired a personal chef in the offseason, and came in at a trim 255 pounds, his body fat below 8%. Now with the body of a Greek statue, Big Al was ready to get his mojo back. His 2006-2007 season would get off to a late start, however. Upon returning from participating in the Las Vegas Summer League, Al was still experiencing pain in the ankle he had hurt the following season. A CAT scan revealed bone spurs in the ankle, with surgery the only alternative. After the August 2 procedure, Al was finally healthy, or so he thought. An emergency appendectomy sidelined him after the first four games of the season, causing him to miss the next seven games. On November 23, Big Al was finally healthy and back in the lineup for good, and the result was the coming out party for the NBA’s next great big man. Already averaging higher totals in points and rebounds, Al was placed in the starting lineup after injuries to three post players, including starting center Kendrick Perkins. 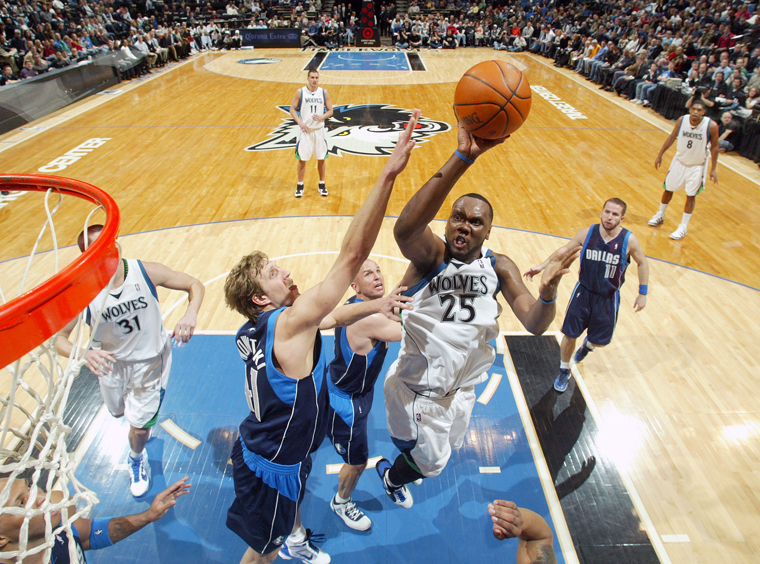 With increased minutes came increased production, and Al made his presence felt night in and night out. He averaged 16 points and 11 rebounds over the next seven games, and in March earned the NBA’s Player of the Week honor for the Eastern Conference. When the season was over, Al had averaged a double-double, notching 16 points and 11 boards a night. He had solidified himself as a rising star, but the Celtics as a team were floundering. 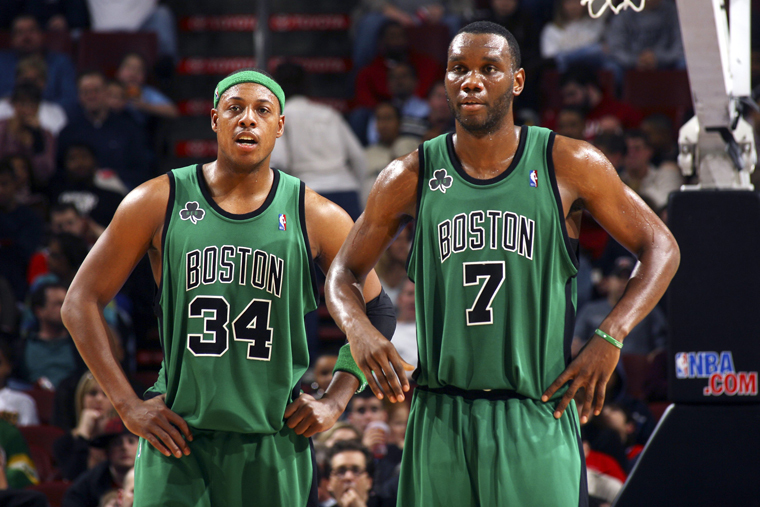 They were a franchise at a crossroads, a mix of young talent and veteran leaders like Paul Pierce. The front office had to decide whether to move players like Pierce and commit to a complete rebuilding effort around players like Al, or trade their young talent for veterans who could bring immediate success. Still, Al felt comfortable with his situation, and felt like he had done enough to warrant an extended stay in Beantown. 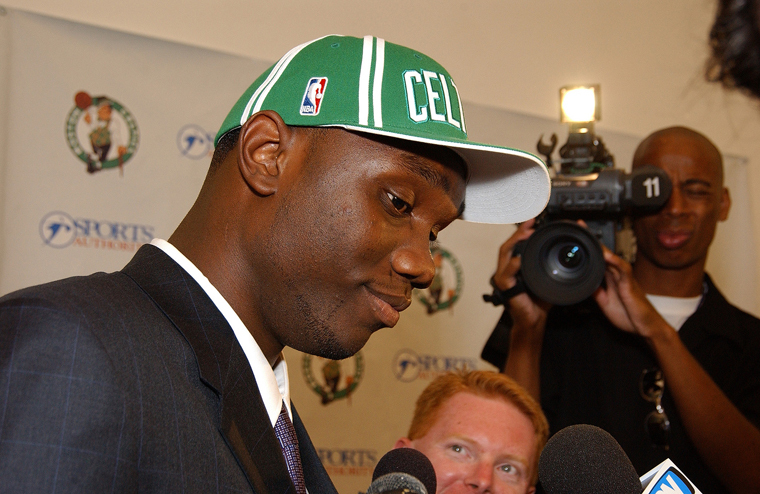 On July 31, 2007, Al received word that the team who had brought him into the league was trading him, along with several other players and draft picks, to the Minnesota Timberwolves for future Hall of Famer Kevin Garnett. The Wolves did their best to make him feel welcome, handing him a five-year, $65 million contract extension. McHale envisioned Al as a franchise cornerstone, a player they could build their young team around. And Al certainly didn’t disappoint. Earning every dollar of his new contract, he started all 82 games for Minnesota, averaging 21 points and 11 rebounds, establishing himself as a premier low-post player and one of the brightest young stars in the sport. His name was plastered all over the league leaderboards, finishing 20th in the league points per game, fifth in rebounding, second in offensive boards, and third in double-doubles. More importantly, the Wolves had found their go-to guy, a floor leader who welcomed the challenge of leading a young, rebuilding team. Al was back at it again in 2008-09, averaging 22 points and ten rebounds until the year was cut short by an ACL tear. Prior to the injury, most NBA experts though Big Al was more than deserving of a spot on the 2008-09 All-Star team. While the Timberwolves keep rolling, 9-2 so far this month, you’d be crazy not to notice Al Jefferson and the numbers that he is putting up. Nothing has really changed since the beginning of the year, only now Big Al is putting up gaudy stat lines in Ws instead of Ls. With Western Conference coaches’ All-Star ballots due on Tuesday, Jefferson decided to leave a lasting impression for coaches checking SportsCenter and the box score to the tune of 39 points on 55% shooting (16-of-29), along with nine rebounds in a win over the Bulls. Looking at his numbers this season, 22.6 points, 10.6 rebounds and 1.6 blocks in only 36 minutes a night, Jefferson has finally helped the franchise turn the corner in the post-KG era. Still only 24, Big Al had one of the brightest futures of any young NBA star. 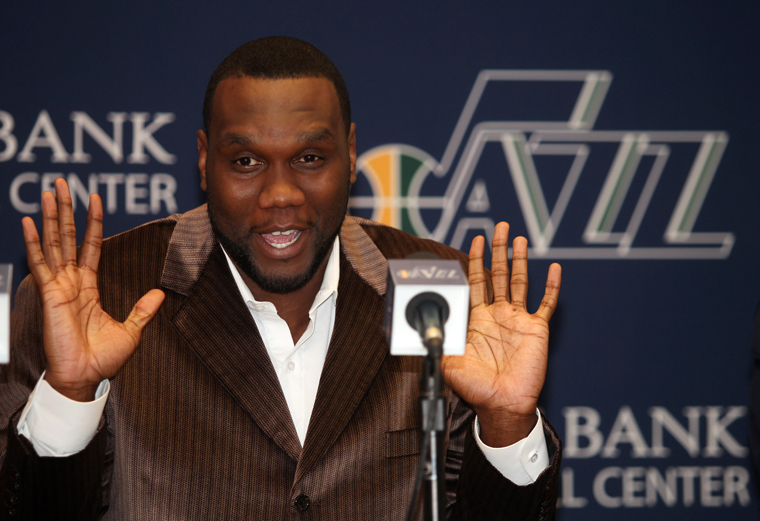 In the summer of 2010, Al was traded from the Timberwolves to the Utah Jazz. Al couldn’t have been happier. While he enjoyed his time in Minnesota, the chance to play with All-Star Deron Williams and the rest of the talented Utah team was a long-awaited gift. The Jazz were thrilled, too. Al’s first season as a Jazz-man brought a few ups and downs the way of No. 25 and his Utah brethren. The in-season departures of coach Jerry Sloan and point guard Deron Williams were a shock to the system, but Al didn’t back away from the challenges. Instead, he saw the need for a new leader and stepped up to become part of the the foundation for a young team to build on. It was an injury-riddled season for the Jazz, but No. 25 started in all 82 games during the regular season. Big Al also regained some of his explosiveness in 2011, showing he was fully recovered from the devastating knee injury he suffered in 2009. The return of Al’s “pop” contributed to his 37 double-doubles during the season and 794 total rebounds–the second highest total of his career. With a new coach and young budding stars all over the court, there was a bright future ahead for the Jefferson-led Utah Jazz. “It was a rollercoaster ride, you know, a rollercoaster ride — a lot of ups and downs,” Big Al said. “A lot of things that happened to this team in one year, teams go through in three or four years. We went through it all in one year. In the lockout shortened 2011-2012 season, Al furthered his improvement, transitioning into his role as team leader while continuing to put up the impressive numbers that have become common for him. Now, if the Jazz keep winning during January and Jefferson keeps producing, the eight-year veteran could finally be in the running for an All-Star spot. He entered a game Tuesday against Cleveland ranked second among NBA centers in average scoring (18.1) and third in the combined statistic of points/rebounds/assists (27.9). 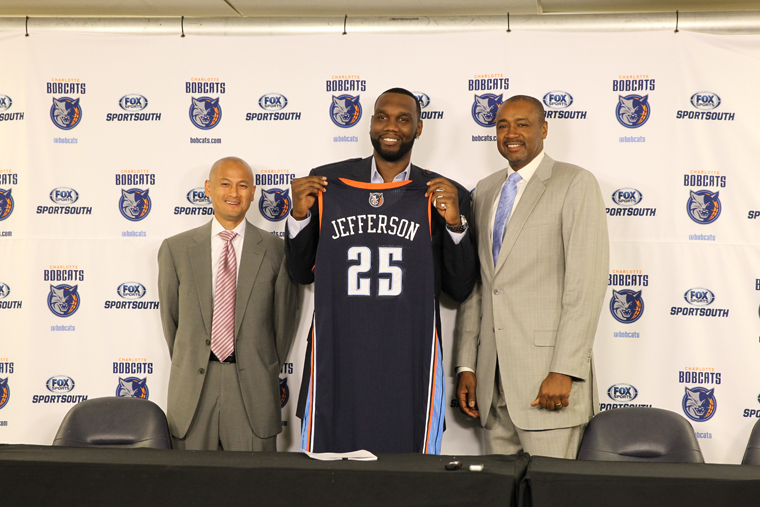 Jefferson’s defense has also improved: he ranked seventh in steals (1.1) and 11th in rebounds (8.4) and blocks (1.5). While Al didn’t get the elusive All-Star selection, he ended the season tied for seventh in the league with 31 double doubles and led his team back to the playoffs. Behind Jefferson’s strong season, the young Jazz finished 36-30 and secured the eighth seed in the West. In the playoffs, they faced the daunting task of tangling with the San Antonio Spurs—the veteran-laden No. 1 seed. Al was matched individually with one of the all-time greats at the center position, Tim Duncan. No. 25 fought valiantly with Duncan, holding him below his season average for points and rebounds. Meanwhile, Al paced Utah with 18.3 points and 8.5 rebounds per contest. 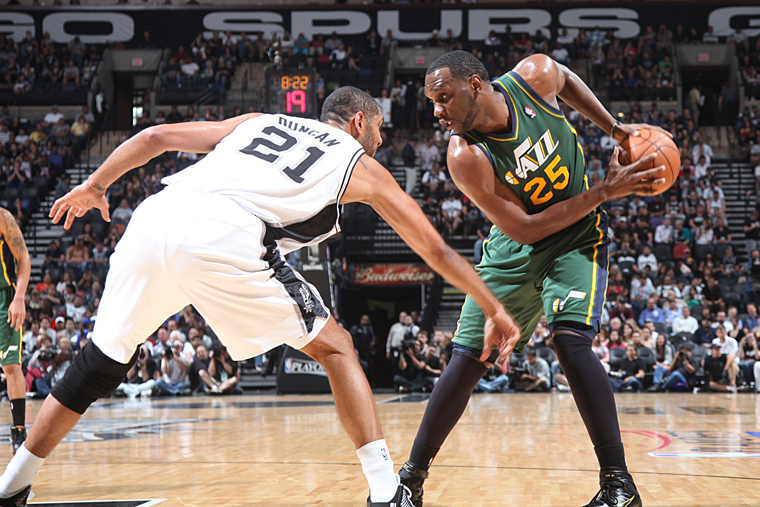 While Big Al matched up admirably with Duncan, Utah simply couldn’t measure up top to bottom against San Antonio. The Spurs swept the Jazz in four games and would eventually go on to reach the conference finals. Heading into the 2012-2013 campaign, Al and the Jazz were facing what figured to be a tightly contested playoff race in the Western conference. Throughout the season, Al was the driving force for the Jazz, leading the team again in scoring and rebounding and finishing in the top ten in the league in double doubles yet again with 37 double doubles compiled throughout the course of the season. Unfortunately for Al, the Jazz narrowly missed out on returning to the playoffs, falling just two games shy of the No. 8 seed with a 43-39 record. Despite the season ending early, Al had established himself as a veritable franchise player, and figured to be one of the most valued free agents heading into the offseason. Just three days into the free agency period, Al inked a three-year deal with the Charlotte Bobcats to become the new centerpiece of the franchise. It was an early and aggressive move for the Bobcats, a team coming off consecutive disappointing seasons that signaled a clear decision by Charlotte to become an immediate threat in the Eastern Conference. At Walker’s exit meeting last season with Higgins and general manager Rich Cho, Walker was asked what upcoming free agent might be most helpful. Walker pulled out his phone, called up a list of those players, and said Jefferson was clearly his top choice. So Higgins reminded Walker that he and Jefferson share an agent, Jeff Schwartz, so it was Walker’s job to start the sales pitch, months before Jefferson officially became a free agent July 1. Walker went to work, scheduling a meal with Jefferson in New York City to express what a good fit this could be. The Bobcats followed up on that effort by immediately making a pitch at midnight the first day of free-agency. Jefferson flew into Charlotte for a visit, expressed his desire to sign here and the deal was done. And Al wasn’t the only one excited about his arrival in Charlotte. Walker was thrilled to see his recruiting efforts pay off for his team. Unfortunately for fans in Charlotte, Al’s arrival was delayed by a right ankle sprain that caused him to miss the entire preseason and nine of the team’s first 12 games. Though he was slowed by an ankle injury at the outset of the season, upon his return, Al showed glimpses of promise while working himself back into rhythm. By the time January rolled around however, Al was finally healthy, and ready to dominate. Al averaged 24 points and 11 boards for the month of January, and never looked back from there. During March, he became the only NBA player besides Kevin Love to average more than 25 points and 10 rebounds for a two-month span this season. Throughout 66 games this season Al has averaged 21.4 points and 10.4 rebounds while posting the 15th best Player Efficiency Rating in the league. He has guided a Charlotte franchise that had only been to the playoffs once in it’s ten-year history into position for the seventh-seed in the East, while leading the team in blowout victories against league giants Portland and Indiana. Al was named NBA Eastern Conference Player of the Week on March 17, 2014 after a week in which he averaged 24.3 points and 11.5 rebounds, and with the award, began garnering additional attention from across the league. Big Al and the Cats closed out the regular season strong. No. 25 eclipsed 20 points in seven of his team’s eight games in April to push Charlotte to the No. 7 seed in the Eastern Conference. Unfortunately, an elusive playoff win wasn’t in the cards. Al was slowed greatly by painful plantar fasciitis in the playoffs. He gutted his way to back-to-back double-doubles and a 20-point game in the first three games of the team’s postseason matchup with the Miami Heat. But he was sidelined for Game 4 as the Bobcats were ousted from the playoffs. But overall, the 2013-14 campaign was a huge success—collectively, as well as on an individual level for The Professor. Big Al averaged 21.8 points and 10.8 rebounds per game, both his highest marks in five seasons. It was enough for Big Al to earn his first All-NBA nod. He finished eighth in MVP voting as well—some well-earned recognition for the veteran big man. The Charlotte franchise began the 2014-15 season with new energy and a new look. The Hornets moniker returned, as did the familiar teal and purple color scheme—marking a new era for the organization. But unfortunately, the first season with the Buzz back didn’t go as planned for Charlotte. The Hornets stumbled out of the gates, going into the 2015 calendar year with just a 10-23 record. 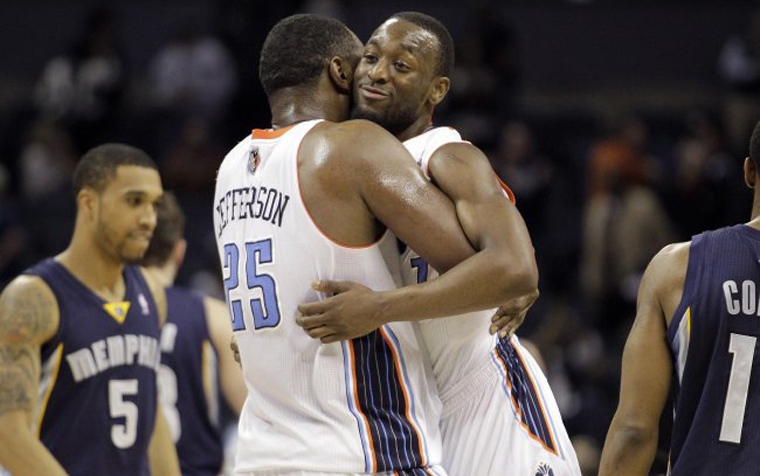 Several key players were injured for Charlotte throughout the year, including Al, Walker and Michael Kidd-Gilchrist. Battered and bruised, the Hornets rallied late in the season, including a five-game win streak to open the month of March that put Charlotte back in the playoff conversation. No. 25 had three double-doubles and three 20-point games in that span to bring the Hornets to within five games of the .500 mark. With the playoffs within reach, Big Al battled through a sore knee, adding three more double-doubles and a 31-point effort against the Washington Wizards later in March. But it simply didn’t come together for Charlotte. Without a season’s worth of continuity, the Hornets’ offense couldn’t find its feet consistently—and to make matters more difficult, Big Al’s knee issues sidelined him for the final seven games of the season as the Hornets fell short of the playoffs. Big Al brought that new mentality to the 2015-16 season and it showed early. Just five games in, The Postman already posted a 30-point game, going for 31 and nine rebounds in a win over the Dallas Mavericks. Al also went for 29 to beat the Portland Trail Blazers, as well as 26 and 10 to top the Philadelphia 76ers. The Hornets were off to a solid start, finishing the month of November at 10-7. But unfortunately, in the month’s final game, Big Al went down with a calf strain and missed nearly a month. He returned for two games in late December—but that’s just how long it took for The Big Fella to tear the meniscus cartilage in his knee, sidelining him until the All-Star break. In the meantime, the Hornets took on a new identity with Cody Zeller as the starting center. When Al returned after the break, he took on a new role, coming off the bench—and it worked brilliantly. No. 25 feasted on opposing benches and caused matchup problems, as he led helped the team post a 25-9 record during the second half of the year. The month of March was simply spectacular. Charlotte won seven straight to start the month and finished 13-3. Embracing his new role, Big Al turned in two double-doubles and two 20-point games, as well as four multi-block efforts in that span. The team clinched a playoff seed on April 2, and finished the season with a respectable 48-34 record and a first-round showdown with the Heat. 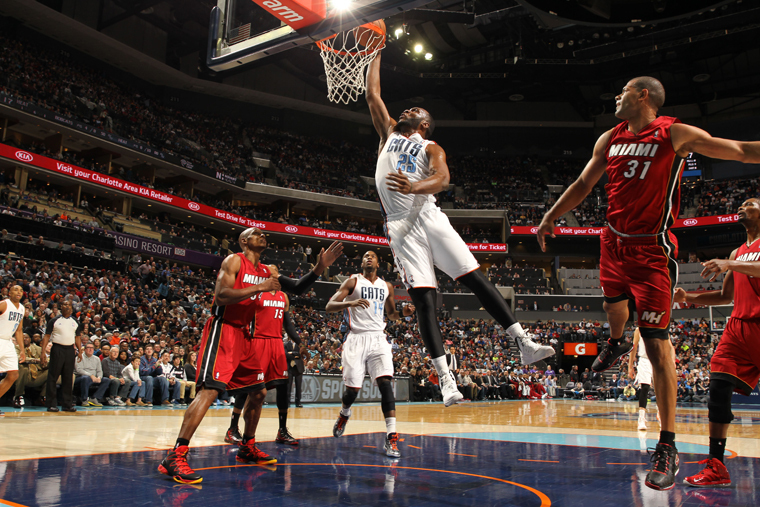 Big Al had a solid series against Miami, highlighted individually by a 25-point, seven-rebound effort in Game 2. That output came in a defeat which put the Hornets down 2-0, but they kept fighting. Charlotte won the next three as Al totaled 33 points, 20 rebounds, six assists, two blocks and two steals to take control of the series. But the Hornets, who hadn’t previously won a playoff game since the original Hornets made the 2002 Eastern Conference semifinals, couldn’t close it out against a postseason veteran squad in the Heat. Miami took the final two contests to end Charlotte’s campaign. When Big Al finished his 2015-16 season, he said that he hoped to return to the Hornets and finish his career in Charlotte. But when free agency arrived, the franchise went another direction as The Postman headed north. On July 8, the Indiana Pacers announced the signing of Big Al—and the Mississippi native said that he had found a new home in Indianapolis. Big Al went on to play two seasons with the Pacers, ultimately helping lead them to two consecutive playoff appearances. In his first season with the team, Jefferson played in 66 games, averaging 8.1 points and 4.2 rebounds in a pivotal reserve role. In year two in Indiana, Jefferson assumed more of a mentor role, helping guide a new, young roster comprising Victor Oladipo, Domantas Sabonis and Myles Turner to a playoff berth and a near upset of the eventual Eastern Conference Champions, the Cleveland Cavaliers. Pacers President of Basketball Operations Kevin Pritchard knew more than anyone that Jefferson’s value during that season went beyond the box score. Big Al’s influence helped young players like Sabonis adjust quickly to the NBA game and have a successful rookie campaign, which contributed to a surprisingly successful season for the Pacers after trading away Paul George. In the 36 games Big Al played in, he proved he was still an effective piece, averaging 7.0 points and 4.0 rebounds in those appearances. However, after the season Big Al decided to move on from the Pacers and the NBA altogether, as he signed to play in China in order to play a bigger role on the court as he wrapped up his basketball career.